You don’t want to draw anything other than a graceful ear in your fashion illustrations. Fashion ears shouldn’t be big and floppy, and they shouldn’t stick out on your fashion head. Fashion ears are often no more than a place to hang a pair of elegant earrings. You don’t want to play up ears on women or men, but you do have a bit of a leeway with the kids. Until a child is about 12, the ears tend to naturally stick out a bit more. Ears are one of the easiest features to master, because they pretty much look the same no matter whether you’re drawing women’s, men’s, or children’s. 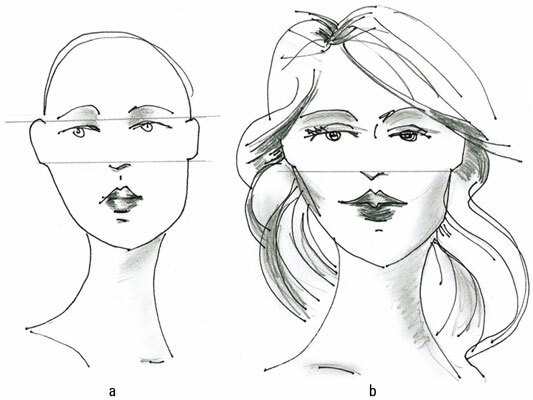 You don’t even have to change what you draw for the different views — front view, profile, and three-quarter view. Use a capital C for a woman’s ear. Use a double capital C for a man’s ear. Draw one C and then draw a smaller C inside the ear for definition and a masculine look. Use a lowercase c for a kid’s ear. The rule of thumb for ear placement is that the top of the ear begins on the side of the face just below the eyebrow line, and it ends just about at the bottom of the nose. This golden rule of fashion helps you keep the face in proportion. Do you ever see ears when your fashion figure has long, thick hair? Not really. However, if your lady has long hair and is in motion, you may need to draw ears. Hair moves when the model does (but not as a solid mass), which allows the ears to peek through. Drawing strands of hair running across the ears, leaving the earlobe visible, creates the right sense of movement. Draw the ears in the same way if the hair is pinned up with a few tendrils tumbling down the neck. Draw a fashion face with C-shaped ears. Sketch in hair with lines covering part of each ear. Let the earlobe show through the hair.